Location: San Diego and Imperial Counties, California, USA. 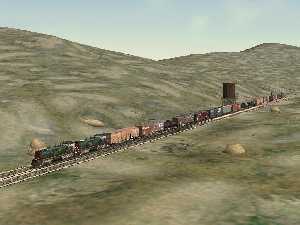 The line through Carrizo Gorge was operated by the SD&A, which used the route to run passenger and general freight service between San Diego and El Centro where the line linked up with the Southern Pacific Railroad. 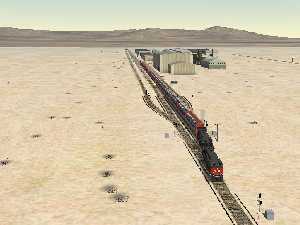 Desert Line: Extends northeast from the International Border (Division) to Seeley, where it joins the Southern Pacific (SP) Line from El Centro. The Goat Canyon Trestle, built in 1932 as part of a realignment of the main line following a tunnel collapse, extends for 633 feet, 185 feet high. It is claimed to be the highest and longest wooden trestle bridge in the United States. When John D. Spreckels built the SD&A, his silent partner was the Southern Pacific Railroad. The San Diego and Arizona Eastern (SD&AE) was the successor operator to the San Diego and Arizona. The name change took place on October 24, 1932 following the death of Spreckels. On that date, the Southern Pacific Railroad took over 100% ownership of the line and renamed it the SD&AE. That was the name under which it operated for the rest of its existence. In 1975 the SP sold the line (except for the Plaster City to El Centro section) to the San Diego Metropolitan Transit Development Board. 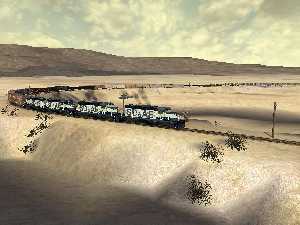 The MTDB hired Kyle Railways, founded by Willis Kyle, to operate the line. Kyle ran the line, still called the SD&AE, until its final end in 1983. Click for more details from Pacific Southwest Railway Museum. 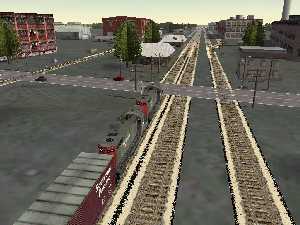 For most realistic running, download and run SD&A and SD&AE consists from my consists page. 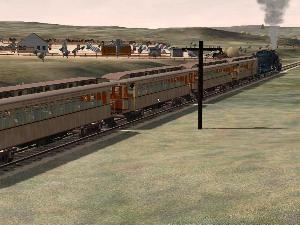 During the time that the SP owned the line, Southern Pacific livery was a common sight..
Total length: 69.9 miles, Presently unserviceable due to fire damage to trestles and tunnels. 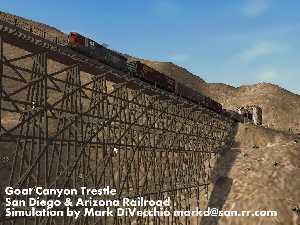 That's about to change - Here is the web site for the Carrizo Gorge Railway. Click here and here for more information. Portion Complete: This simulation extends the entire 69.9 miles from Division to El Centro rising 1466 ft and then dropping 3613 ft in elevation. The SD&A is brought to you by John D. Spreckels. This MSTS simulation by Mark DiVecchio ( markd@silogic.com ). Read about the SD&A at Wikipedia. The route is available for download at on my Download Page. 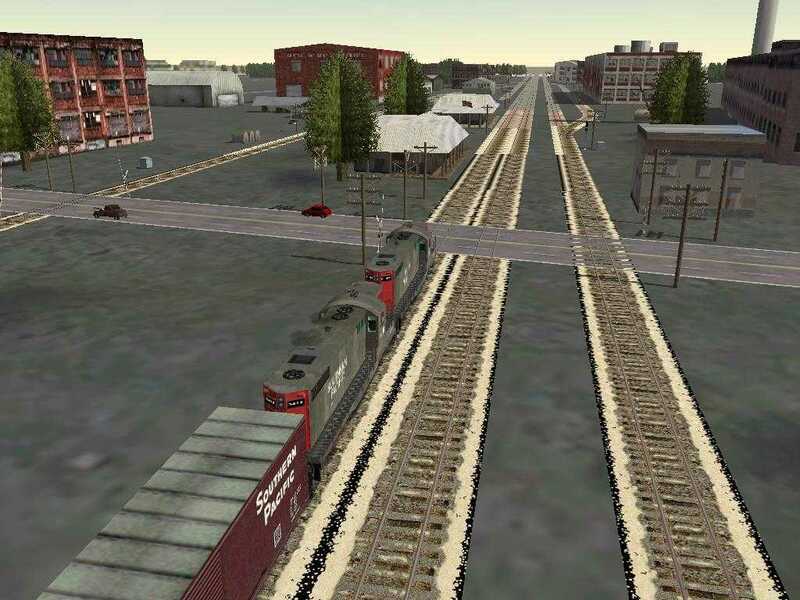 This route and these trainsets cannot be used for any commercial ventures for profit or distributed in any other form or on CD, any recordable medium or any web site without my express permission. 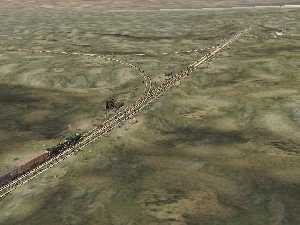 This route is released with all original copyrights retained. Please respect the original designers copyright. New content is copyright by Mark DiVecchio. 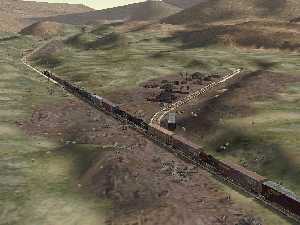 This route has been tested on several computers with no problems. I am not responsible for anything which results from its use, and no warranty of suitability for any purpose is implied. This route is an eclectic combination of eras on the SD&A. The Last Spike was driven on November 15, 1919 (thanks for jjschaible for a correction to this date). The line operated from 1919 to 1976 when on September 10, 1976, Hurricane Kathleen badly damaged it. It reopened in 1981 only to last until the summer of 1983 before being shutdown due to fire damage to several tunnels and trestles. 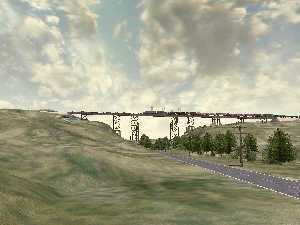 The presence of the Goat Canyon Trestle indicates operation after its construction in 1932. The fact that tunnels 8 and 16 are still open, indicates operation before their collapse in the 1980's. The presence of the DeAnza Springs Resort (Clothing Optional) along the line indicates operation in the mid 1990's although the line was finally put out of operation a decade earlier. Siding locations where I could not physically visit were taken from USGS maps last field checked in 1975. 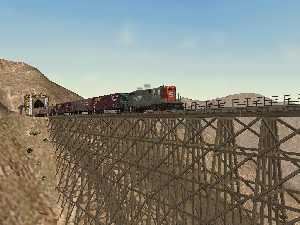 I've hiked along this railroad from Dos Cabezes to Dubbers, over trestles and through tunnels. Read this special note from CZRY about hiking the line now that its being reopened. I've driven the dirt roads around Jacumba, Sugar Loaf and Coyote Wells. It is an area of San Diego County that I love. I've put "Place Name" signs all along the route so you can get an idea of where you are, but, of course, real railroad men didn't need such nonsense. Turn on Distant Mountains for the best effects. 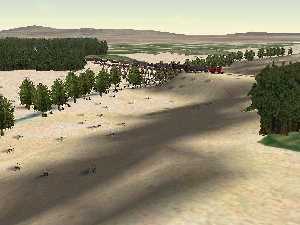 This is a desert route, so it does not contain snow, winter, autumn or spring textures. Some night textures may be missing as well. In MSTS, the route will display as "Carrizo Gorge v2.1". Comments are always welcome. Please send me any activities that you develop and I'll include them here. This very likely the last release of the San Diego and Arizona Route by me. It is released as an upgrade to v2.0. I used RouteRiter to create the update ZIP file. So you must have v2.0 installed before you can use this file. SEE THE INSTALLATION INSTRUCTIONS BELOW. The purpose of this release was to make the route easier to write activities for. I improved all the signals and moved them to the right side of the track. I named all the sidings. I wrote several simple but real activities. I added a little more scenery and static objects. The list of changes is below. Note: SP_ALCS4 and SP_BOX5 are contained inside of SPBOX5PK. shows the directory name and *.wag or *.eng file name. The remaining activities are dummy activities so there will be starting points for explore route. station to be in the center of the platform. 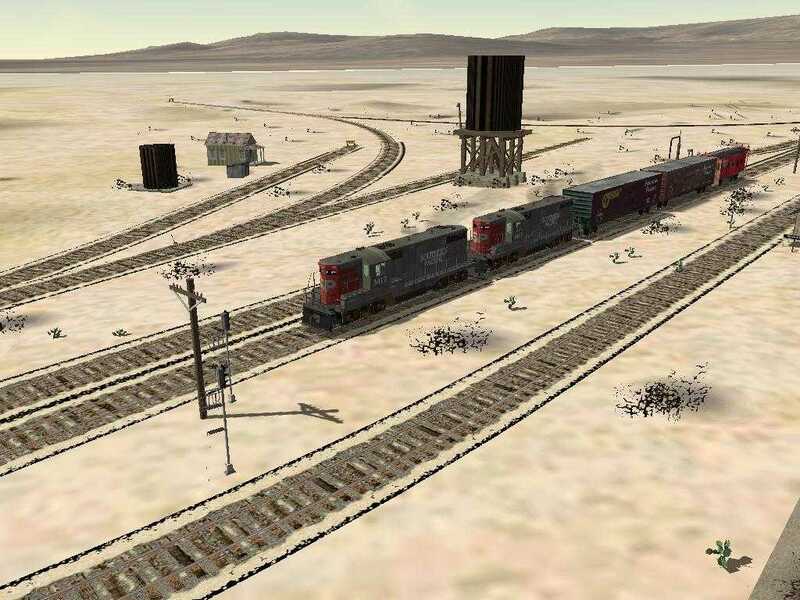 At southern El Centro, add more signals covering first 4 signals from the south. Put depot.s around so that player will know where the station is. Developed a lot of reskinned engines - they are all on my SD&A Web Site. This route requires about 163 Mb of disk space and requires that you have have all 6 default MSTS routes installed. The file sda20.zip contains the route. You can download it from my Downloads Page. 2 - Go to the newly created SDA20 folder and find the file named InstallMe.bat. Double click on InstallMe.bat. This will open up a DOS window and copy many files from the default routes. Be patient, this process takes several minutes. When the batch file is complete, the DOS window may close, if not simply click on the "X" in the upper right corner of the DOS window. 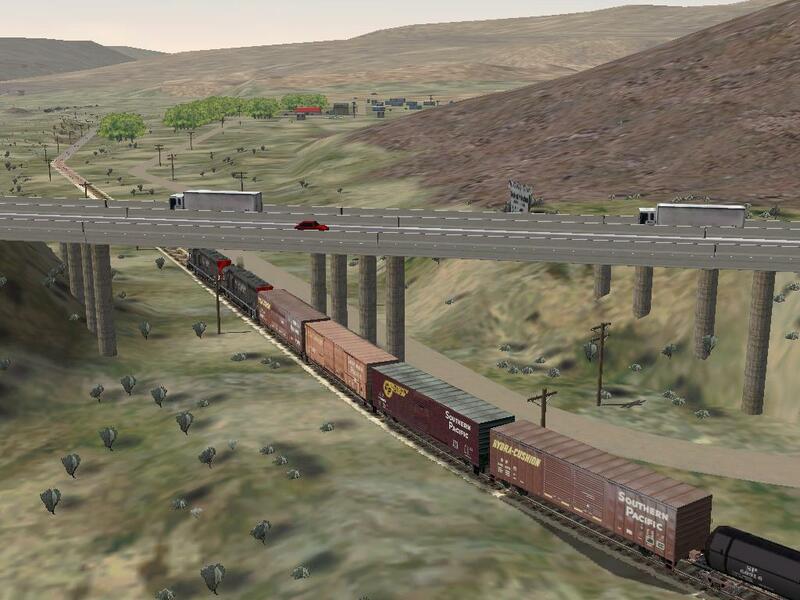 3 - Start MSTS and select "Carrizo Gorge v2.0". Go to Explore Route and pick a starting point for your adventure. This route requires about 190 Mb of disk space and requires that you have have all 6 default MSTS routes installed. The sda21_patch.zip file will patch version 2.0 of the San Diego & Arizona Railway to version 2.1. You can download it from my Downloads Page. Special Note: the original name of this file was sda21_patch.zip. If you have trouble installing it with its name as found on train-sim (they renamed it using the 8.3 filename format = "sda21pat.zip"), please rename the file to "sda21_patch.zip" and try again. If necessary, you may have to manually create the folder named "sda21_patch" and then unzip the patch into that folder. The "updateme.bat" script requires that the new folder to be named sda21_patch or else the install scripts will not work correctly. Note that after conversion, the original version will NO LONGER be available on your system. If you wish to retain the original version, use Windows Explorer or other file utility to copy the route to a temporary folder until the conversion has completed. The new version will be renamed, so once it is installed, it is quite safe to move the old version back and then both versions will be available. You must have version 2.0 of the route and the 6 default MSTS routes available on your PC for this installation to work. 1. Unzip this Patch into your MSTS\Routes folder, it will be placed in a folder named Sda21_patch - Ensure that your copy of WinZip has 'Use Folder Names' checked. If WinZip does not create the folder for you, then create it manually and unzip the patch into it. All the patch files MUST be in a folder named sda21_patch for these scripts to operate correctly. 2. Navigate to the Sda21_patch folder and double click on UpdateMe.bat - This batch file will copy all the necessary files from the Patch folder into the old route folder, delete some old files, and rename the folder to the new route name. 3. Once this has finished, you will be advised to 'Press Any Key' to run the installme.bat file which will then copy any necessary files from the Default routes. The new version of the route will be installed in the directory sda21. 4. Upon completion, shut the DOS window, delete the Sda21_patch folder which is no longer necessary (and will confuse MSTS if not deleted as MSTS thinks it is another route). 5. Run your new route. 6. All of the *.con files needed are in the directory "Consists". Move all of these to the MSTS Consists directory. This patch was produced using Route-Riter. This route requires about 163 Mb of disk space and requires that you have have all 6 default MSTS routes installed. The file sda21.zip contains the route. You can download it from my Downloads Page. 2 - Go to the newly created SDA21 folder and find the file named InstallMe.bat. Double click on InstallMe.bat. This will open up a DOS window and copy many files from the default routes. Be patient, this process takes several minutes. When the batch file is complete, the DOS window may close, if not simply click on the "X" in the upper right corner of the DOS window. 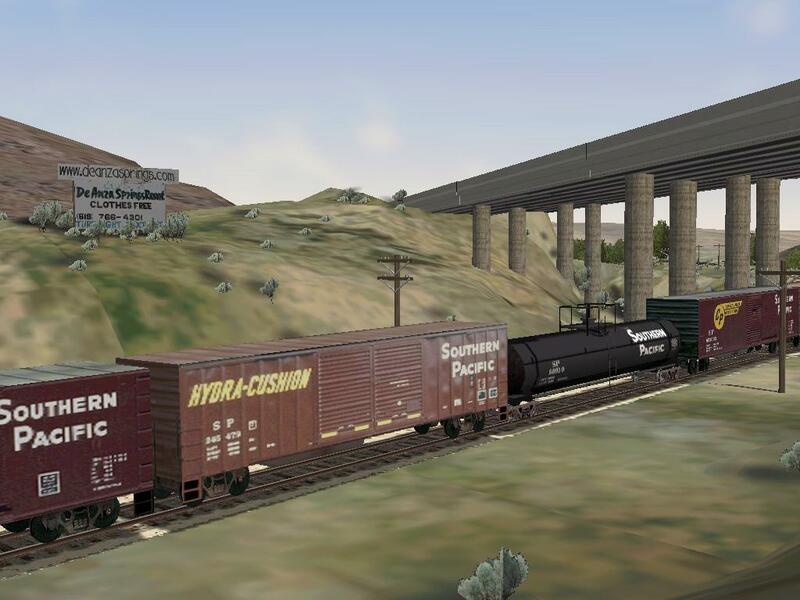 3 - Start MSTS and select "Carrizo Gorge v2.1". Go to Explore Route and pick a starting point for your adventure. Route builders have permission to use any of my objects, indicated by the prefix "SDA1_" in their routes as long as the route is distributed for free and credit is given to me in the README. They may not be used in any commercial project or distributed singly without my written consent. You have my permission to upload this route onto any web site as long as you upload the ZIP file unchanged. I would appreciate an email note letting me know that you did that. This route is provided "as-is" without any warranty of any kind. Division (MP 60.07) - Just north of the border with Mexico. I've never been here. Tried to model it from satellite photos. I included a gate across the entrance of the tunnel since Customs must inspect every train that crosses the border. 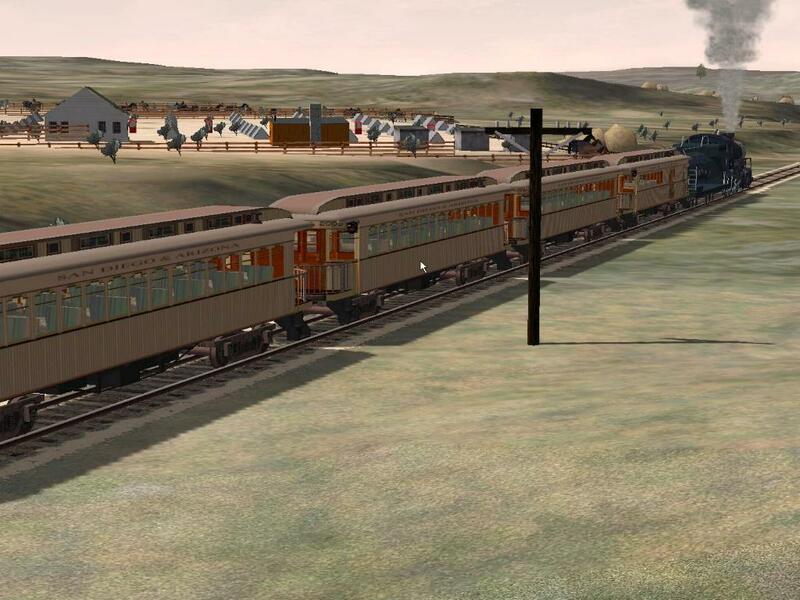 Campo (MP 65.8) - Modeled as it appeared in the 1950's well before the Pacific Southwest Railway Museum (PSRM) opened. The town of Campo is much larger now. The Buffalo Soldiers of the 28th Cavalry was located at Camp Lockett near Campo. The 28th trained and then served as border patrol from Camp Lockett before being shipped to North Africa in 1944. 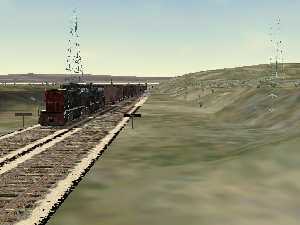 Clover Flat (MP 71.9) - Modeled from an old PSRM photo . 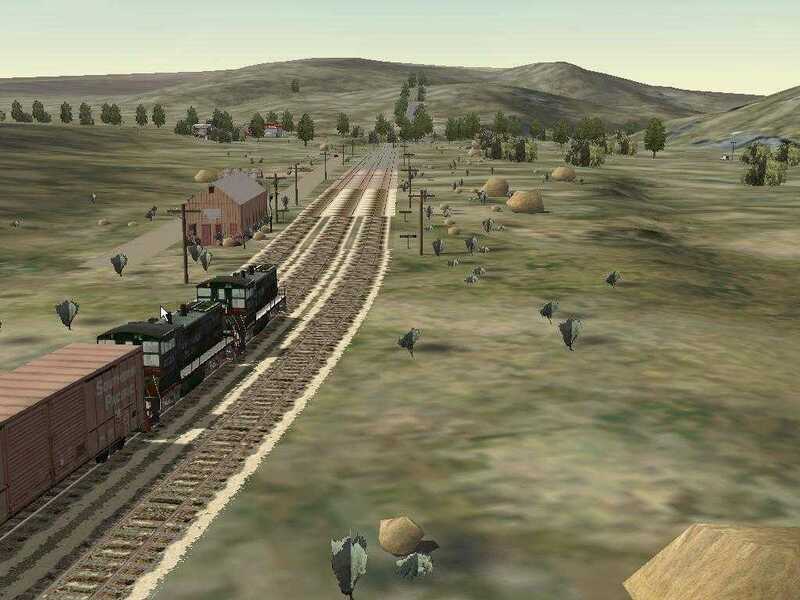 The tourist train from the Campo home of the Pacific Southwest Railroad Museum does weekend runs to a new siding called Miller Creek near Clover Flat. The siding at Miller Creek was constructed by Museum volunteers in the 1980's. I've also been told by a long time member of the PSRM that the water tower was actually at Miller Creek (where water was available). That means my modeling of the water tower at the Clover Flat siding is not exactly correct. I was just looking over your SDA page and it looks like you did a great job on your MTS skin. I just have one correction from your web page if you are interested. Your site says..
- Clover Flat (MP 71.9) - Now called Miller Creek. Modeled from an old PSRM photo . The tourist train from the Campo home of the Pacific Southwest Railroad Museum does weekend runs to this siding. Clover Flat is not now called Miller Creek They are different places. They are pretty close though. Miller Creek is roughly around MP 73.5 and the water tank used to be at the east end of the now Miller Creek siding, and was located about MP 73.8. I am not aware that there was ever a water tank actually at the Clover Flat siding, but I am not positive about that. The footings are still in place at Miller Creek for the water tank, and at Clover Flat, the switch ties are still in place where the siding used to be. The old time tables list there being water at Clover Flat, so either there used to be a tank at Clover Flat siding, or they just considered the now Miller Creek as part of Clover Flat, but we have both stations listed now. Certainly not a big discrepancy, but I thought you might want to know. Your skin looks very good, maybe someday I will try out MTS again, and load up your skin. 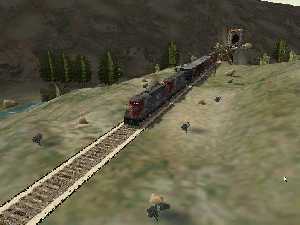 I quit playing it shortly after it came out, since the train operation was not authentic at all, and it frustrated me. Have you ever been out to Campo and on our trains? If not, I would be happy to invite you out for a complementary train ride to Miller Creek and back. 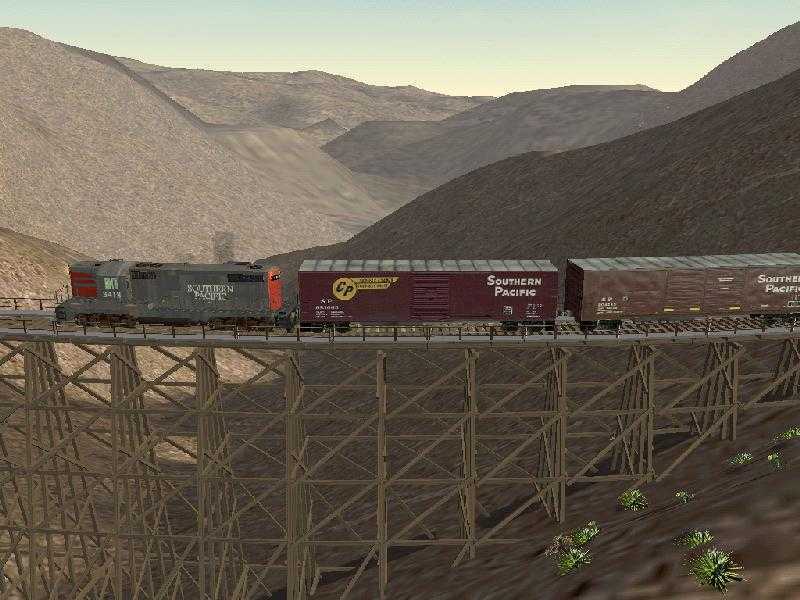 High Bridge (MP 77.27) - This bridge carries the SD&A over US 80 (now CA Route 94) between Campo and Jacumba. The second screen shot was taken by Brian A Elchlepp. Pueblo (MP 78.2) - I don't know if this ever was a real station. Its on the Campo Indian Reservation. I've never been there. Hipass (MP 84.5) - I've never been here. 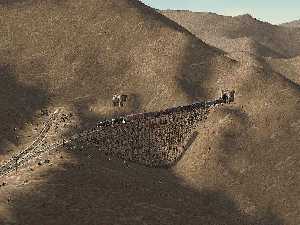 Modeled from satellite photos. From recent PSRM photos , the wye is no longer there. Photo shows the phonebooths found in many places along the route. Jacumba (MP 92.9) - Modeled from photos from the 1970's, from old SD&A documents and from my photos. Titus (MP 94.0) - I've never been here. Modeled from satellite photos. Named for Harry L. Titus, Spreckels' chief counsel. DeAnza Springs Resort - Just before Dubbers near the I-8 bridge is the DeAnza Springs Resort. Another view is here. Dubbers (MP 96.0) - Modeled from my photos. Named for A. Dubbers, SD&A's Division Engineer at Carrizo Gorge. Carrizo Gorge (MP 100.7) - Modeled from Topo maps from the 1970's. This station is really different in the real world today. Looks like the siding was moved a mile from what the maps show. Goat Canyon (Tunnel 15 Spur) (MP 102.3) - The Goat Canyon Trestle, built in 1932 as part of a realignment of the main line following a tunnel collapse, extends for 633 feet, 185 feet high. It is claimed to be the highest and longest wooden trestle bridge in the United States. Dos Cabezes (MP 109.7) - Modeled from my photos. I modeled a building there but from the ruins of the area, I can't be sure. I put the freight platform there for activities. I don't think there was a real one there. Dos Cabezes is Spanish for "two heads"; supposed pair of rock formations that resemble heads. Sugarloaf - Modeled from my photos. I believe this was a mine but I don't know for sure. Today there are a few foundations and a concrete lined pond there. Coyote Wells (MP 122.5) - Modeled from my photos and old SD&A maps. The wye and tanks are no longer there. Anza Borrego Desert - Miles and miles of nothing but miles and miles. 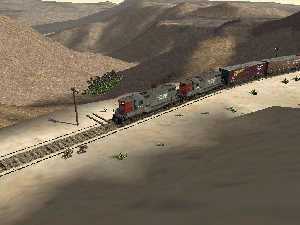 Here are SD&AE GP-9 numbers 101, 102, 103, and 104 pulling a long east bound freight through the desert. The screen shot was taken by Brian A Elchlepp. Plaster City (MP 130.0) - A rough cut at the US Gypsum Plant. The track is from from old PSRM documents and now you can't get close enough to take pictures. 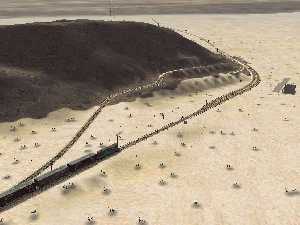 A narrow gauge railroad from the Plaster City processing plant to the gypsum mine about 30 miles away. Another link here . 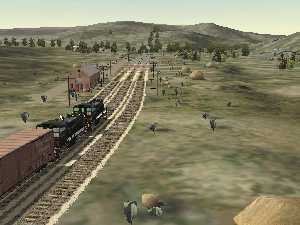 Seeley (MP 139.8) - Modeled from my vision about what an old time small western town would look like. Canals - With water from the Colorado River, the Imperial Valley has been turned from a desert into a lush farmland. 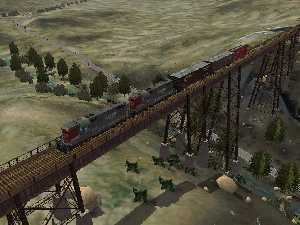 Here is the SD&A #43 crossing over the Central Main Canal just west of Seeley. New River - In 1905, a temporary diversion of the Colorado River, constructed to replace water from the blocked Imperial Canal, is breached by floodwaters. This breach became the New River and the Salton Sea was born. More Info . Wilsie (MP 145.1) - All that is left here is a siding. Old SD&A documents show that a packing plant used to be here. 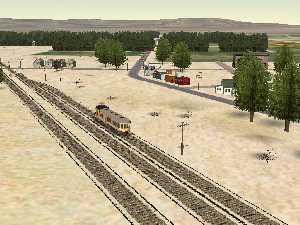 El Centro (MP 147.84) - The track is from old SD&A documents. The buildings are from Enocell. His buildings give the flavor of what used to be. 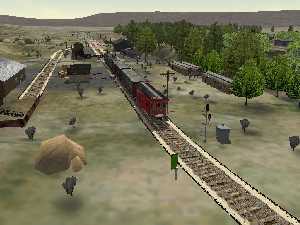 The Holten Interurban Railroad provides service from Holtville to El Centro. It enters the SP main line via a wye. I've not included that part of the line in this route. 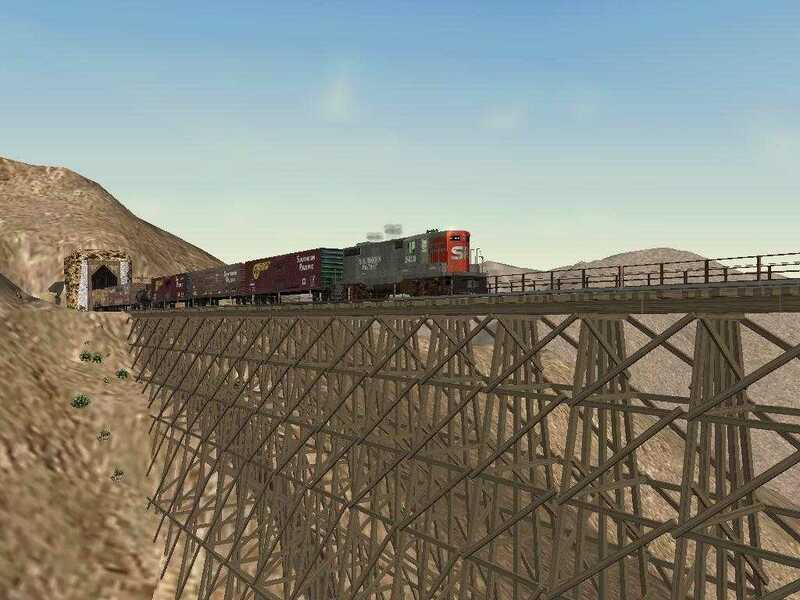 The consist down in Carrizo Gorge near the southern entrance to Tunnel 8 looks like a piggyback trailer car. From what I could see of the derail, it was carrying two Coors trailers. The two box cars over the side of the Gorge, north of Goat Canyon are SP box cars. They are empty. The southern terminus of the Pacific Crest National Scenic Trail is just south of Campo. I modeled it and the point where it crosses the SD&A. Look for the sign. Here is the Route Geometry Extractor view of the route. It will give you an idea of where the route is located. You will be able to see that the line runs along the southern end of California both north and south of the Mexican border. Click on the thumbnail image to see a larger (262Kb) view. Click here for a close-up RGE view. I used TsTools to set the markers. Click here for a screen capture of the TsTools layout. With TsTools, I could overlay DRG maps from the USGS and get accurate placement of markers for the route and for scenery. I used DEMEX to generate the terrain. 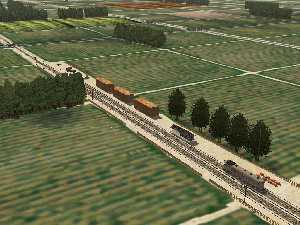 Click here for a screen capture of the DEMEX layout. The lighter gray is higher elevation. Just to the left of the center, you can see Carrizo Gorge running from south (higher elevation) to north (lower elevation). DEMEX also did the Distant Mountains. Here is a profile of the line. Route Riter for getting the Distribution Package ready. 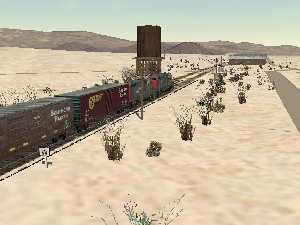 Robert Hanft's book "San Diego & Arizona: The Impossible Railroad"
and his Grain Silo Kit. My thanks to all route builders and scenery builders who preceded me. Look in the route ZIP file for all the readme.txt files with thanks given for all shapes and textures used. Here is a new version of camcfg.dat. I got this as part Michael Vone's Albula Line 2. As far as I'm concerned, this is a MUST have addition to MSTS. Note especially the "yard" view (7). You can download the new camcfg.dat from here . Modified camera views: Included with this route is a modified camcfg.dat that allows you great flexibility with the different camera views. 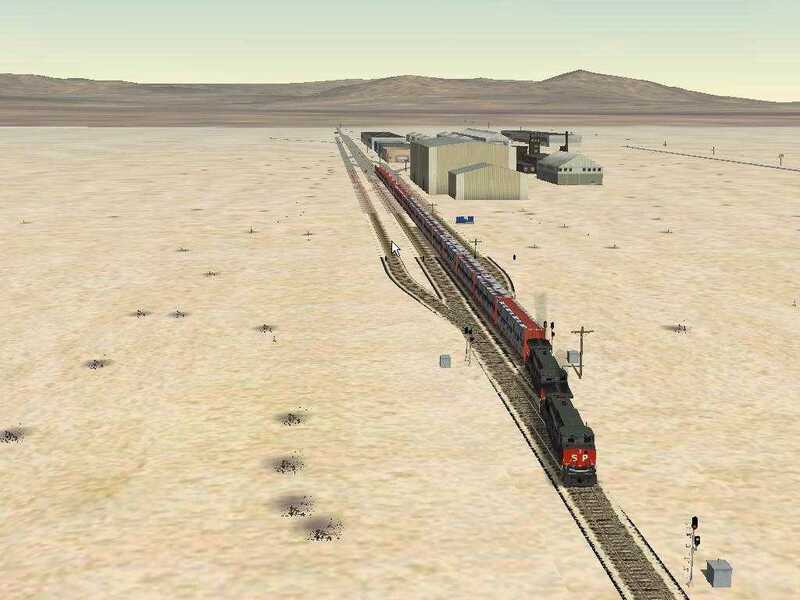 To use it, copy it from this route's Documents folder into the Train Simulator's GLOBAL folder, after backing up your old version. 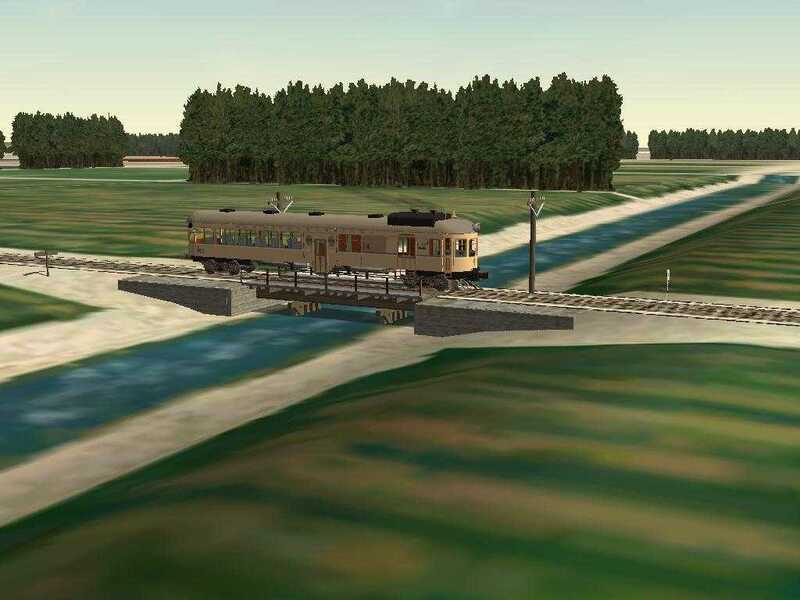 If you want to go back to the original file camcfg.dat, a copy is available as camcfg(original).dat in this route's Documents folder: to use it, delete the modified version from the Train Simulator's GLOBAL folder, copy camcfg(original).dat to the Train Simulator's GLOBAL folder, and remove the "(original)" from its name, so it is called camcfg.dat. In the "head-out" view (Shift-1), after pressing Ctrl-Shift-9, you can rotate the camera vertically and horizontally, by dragging the mouse while pressing its right button. In the "front-tracking" (2) and "rear-tracking" (3) views, after pressing Ctrl-Shift-9, you can rotate the camera vertically and horizontally, by dragging the mouse while pressing its right button (while still moving the camera around the train with the arrow keys). In the " track-side" (4) view ("spotter cam"), you can rotate the camera vertically and horizontally (by dragging the mouse while pressing its right button), and change its height and distance (with the left- and right-arrow keys). After pressing Ctrl-Shift-9, you can move the camera vertically and horizontally (but not rotate it), with the arrow keys. In the "passenger" view (5), after pressing Ctrl-Shift-9, you can rotate the camera vertically and horizontally, by dragging the mouse while pressing its right button. The "coupling" view (6) is not changed. In the "yard" view (press 7 while in any station), you can move the camera anywhere you wish in the entire route (with the arrow keys) and rotate the camera freely, by dragging the mouse while pressing its right button; note that the yard camera becomes independent of where your train is located: you can explore the entire route as if in a helicopter (but the height above the ground is limited). The "derail" view (automatic) is not changed. Note that I gave the camera views non-default "fields of view" (called FOV inside the camcfg.dat file, which gives the angles of camera view in degrees; by default they are 60 degrees); you may change these FOV values with WordPad: a small FOV gives a zoom effect, while a large FOV gives a "fish-eye lens" effect. San Diego and Arizona Railroad "The Impossible Railroad"
This fix is from the experts on train-sim. It worked for me but use at your own risk. Q "While watching a TV show, I saw a train with the initials SD&AE on the side of the locomotive. What do the letters stand for and where does this railroad run?" A "This is the San Diego and Arizona Eastern that extends from San Diego to El Centro, California, a distance of 150 miles. The company was owned and operated by the SP. In 1976, a tropical storm washed out the line in many locations and service was suspended. An abandonment petition was filed, but fortunately, most of the route is still in operation and became independent of SP control. Part of the line is now the San Diego transit system. Some, if not all, of the motive power is ex-SP." 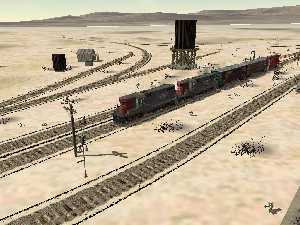 "According to the "California Region Timetable #13" of Altamont Press, it shows the speed limit from Plaster City (SDIV Junction) to El Centro as 25 MPH (as a Union Pacific Route)...then from Plaster City to Lindero Division, Baja California (the point where the line enters Mexico on the eastern side) has a speed limit of 15. BUT -- the section from Plaster City to Dubbers is noted as "OOS" (Out of Service) and Dubbers to Lindero Division as "YL" (Yard Limits). Garcia to Tijuana/San Ysidro, California 15 MPH"
The first is automatic and runs a simulation from Division to El Centro. This system has a big display and LOUD audio. 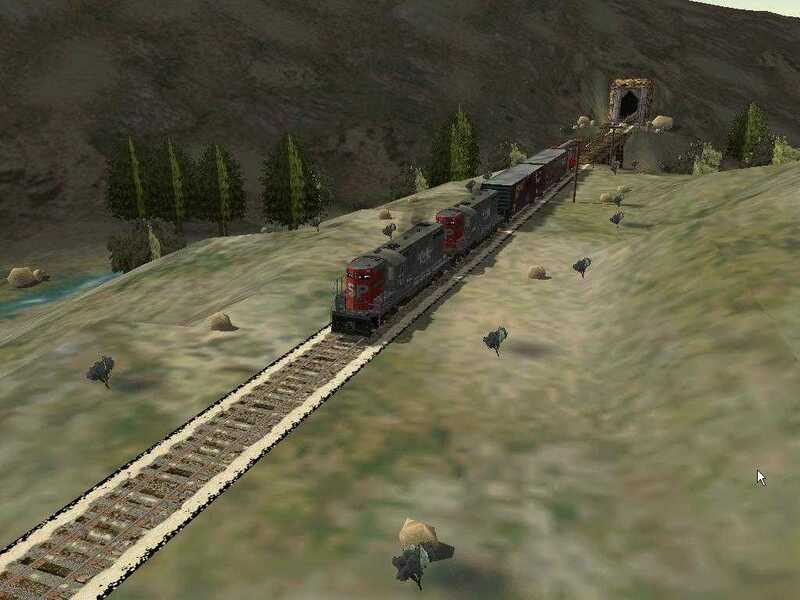 The second is interactive and lets you run a train using the RailDriver Controller. This simulation starts just west of Jacumba and runs into Carrizo Gorge. At the controls is Daisy Welsh, one of the docents at the museum. What are the top ten most downloaded routes Train-Sim.com?